LEDs are great for model building lighting. They don’t take much power (allowing lots of them to be powered by one power supply), don’t make any heat (so you don’t have to worry about melting or deforming plastic structures), and last a very long time. However, they are small and can be hard to solder. Pre-wired modules can solve that problem. 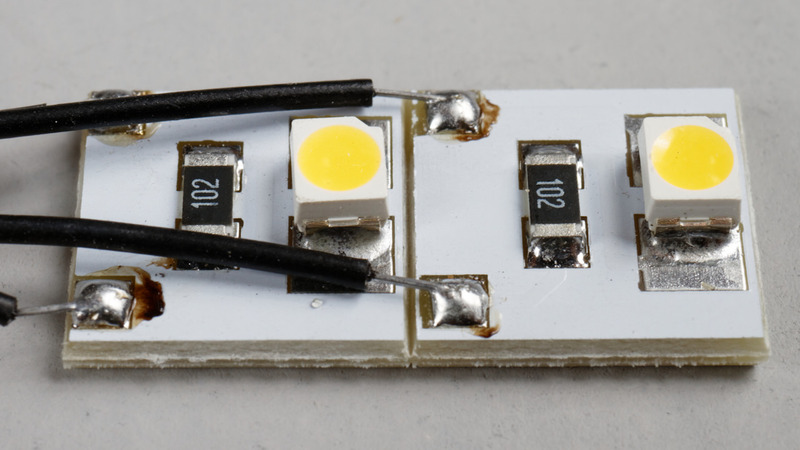 I talked about lighting buildings using 12VDC warm white LED sign/lightbox modules in a previous article, and I have now found easy-to-use 12 volt single LED modules on Amazon. 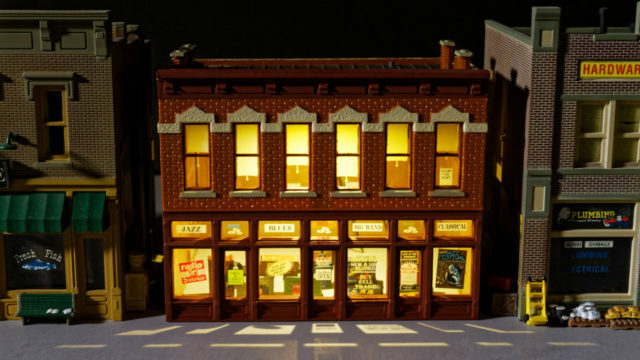 HO scale building lit with one Evemodel single LED module. The module was taped to the underside of the roof near the front of the structure. A few crates were placed on the floor inside as a minimal interior for this photo. Evemodel now sells small, pre-wired warm white LED modules on Amazon. 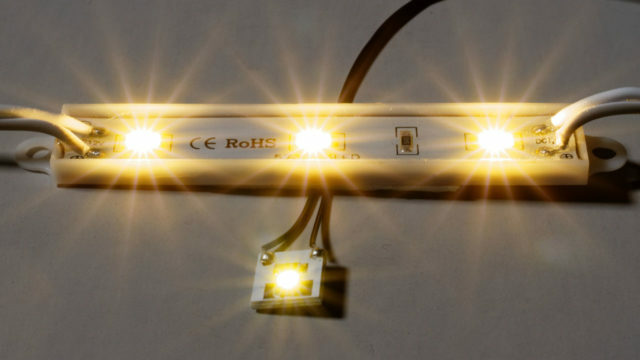 They come in packages of 20 pieces for $11.99 (60 cents each) and use surface mount 3528 LEDs on a tiny circuit board. Wire leads are already soldered to the circuit board, which have the correct resistor to run the module on 12 volts DC. The Evemodel modules have a warm white LED and the required resistor to power it on 12 volts DC. The as-delivered circuit board is pre-cut to break off individual pre-wired modules for use. 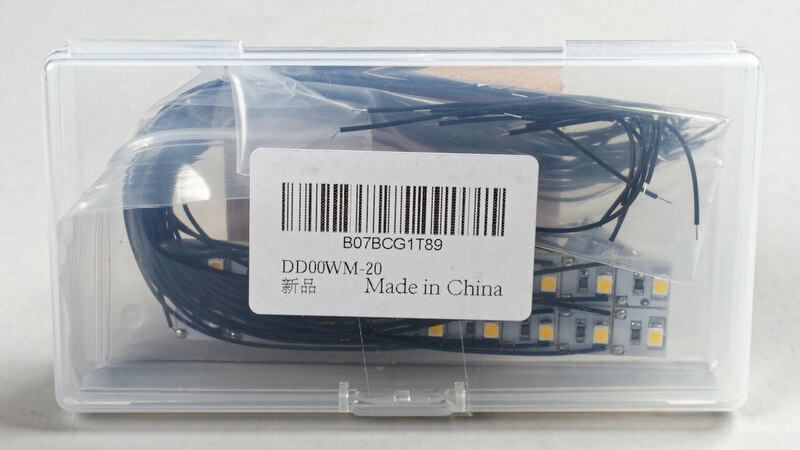 The Evemodel LED modules as delivered. 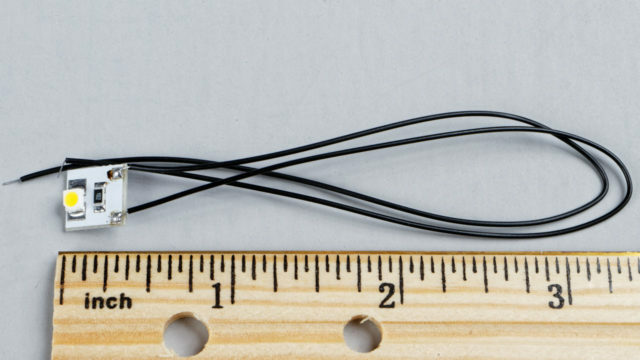 The individual modules are tiny, only 1 cm square (about 3/8-inch). I taped one inside an HO scale Walthers Trainline Gemini building using electrical tape for my example photo. It’s amazing how well this one LED lights the entire building. An appropriate interior needs to be added for most lit buildings, especially those with large windows. A photo of a building interior would work for a “back wall” behind a modeled interior or as a simple interior. Some interior photos you can print are available on our site. 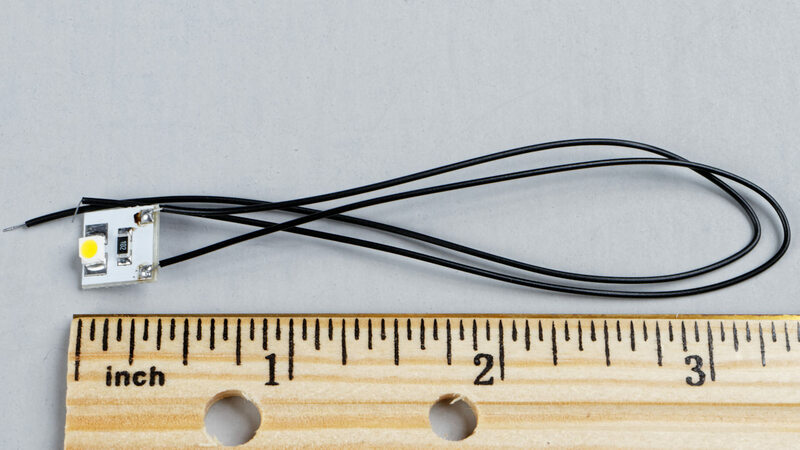 Each module is approximately 1 cm (3/8 inch) square and is pre-wired with 6-inch leads. The one module provides enough illumination for a small building. 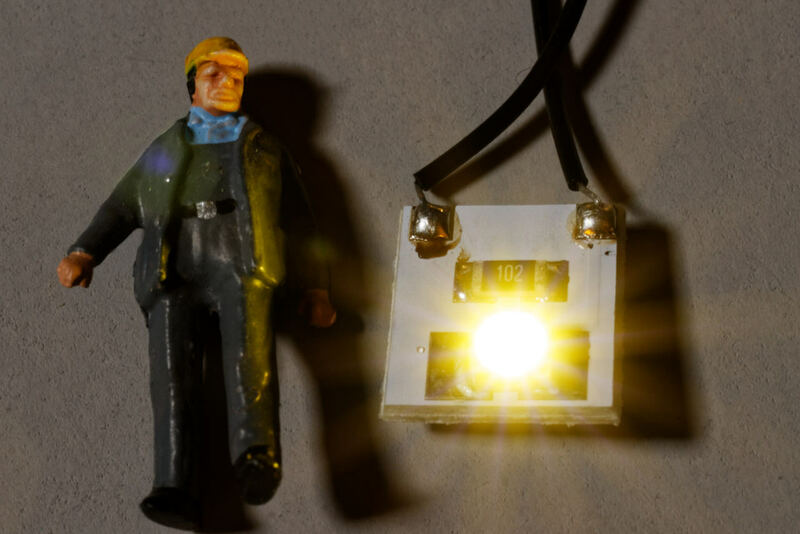 The single LED is about as bright as the individual LEDs on the sign module I use to light larger buildings. 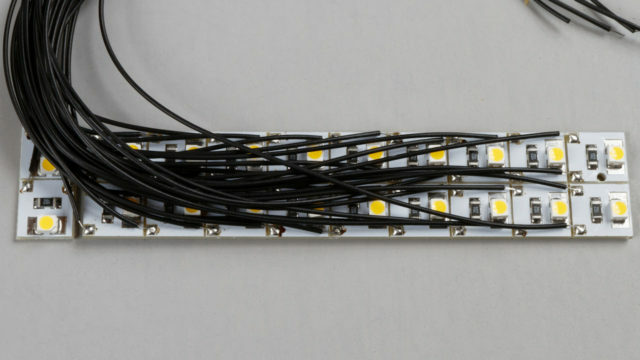 Comparison of the Evemodel module to the 3-LED sign module from my previous article. The circuit board can be easily attached with double-stick tape, Walthers Goo, epoxy, or a drop of hot glue. It’s really small, about the height of an N scale figure. An Evemodel module compared to an HO scale figure. The Evemodel modules arrived in a plastic bag inside a small plastic box.